I woke up one morning a few days ago, and thought I really need to crochet…today. I have random bursts of creativity where I must act upon them now. I had a wonderful, creative friend in high school teach me how to crochet (Thanks Amy!). Today, I wanted to do the fancier stuff. 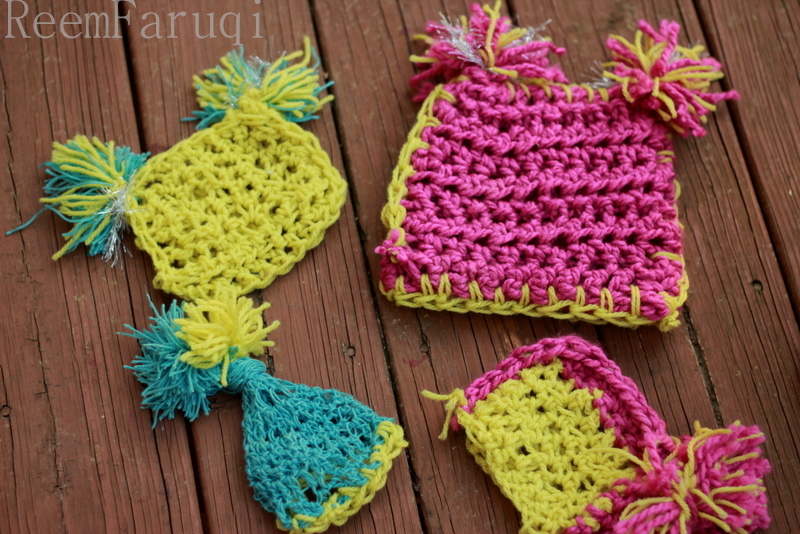 I You Tubed how to make baby boots, and how to make hats. I also bought a beautiful book called ‘Welcoming Home Baby the Handcrafted Way’ by Tricia Drake in a quaint book store, some fun wool from Michaels, and some even more fun yarn from a specialty yarn store called Sheepish. At first I bought classic baby colours, baby yellow, baby pink. I even bought myself some itty bitty crochet needles. The pastel colours eventually tired me along with the too-tiny-needles. Yes my stitches were even, and the half-made socks were nice, but I was getting bored. I was tired of the pastel itty bitty stitches for itty bitty heads. I dropped the pale yellow, and pale blue wool and let my eyes wander. 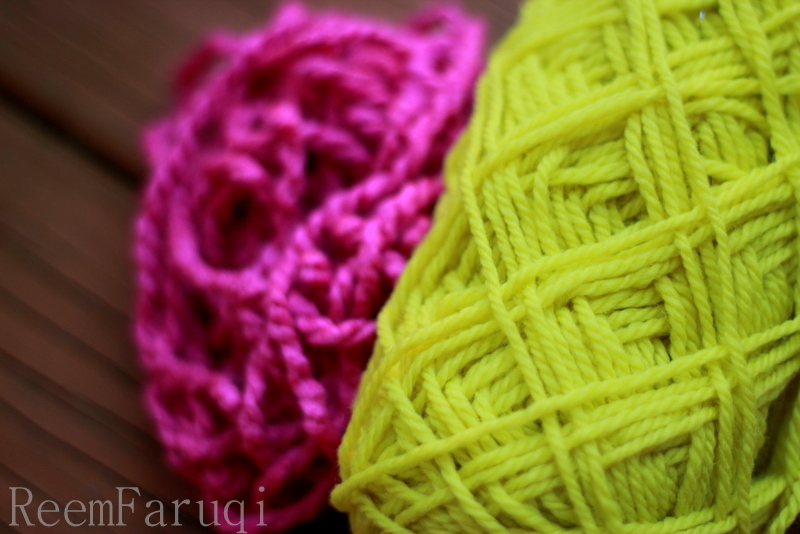 My eyes were drawn to this beautiful chartreuse green wool I had purchased. Z has one chartreuse green shirt and it’s such a refreshing colour from all the pale pinks that she has. I was inspired by the book I read by Tricia Drake, a mom of 7, yes 7 kids, who knits her babies the most beautiful hats. She lamented that being short of time, she would use these super big knitting needles. As a result, her hats would be finished quickly, and would be made chunky, and funky. 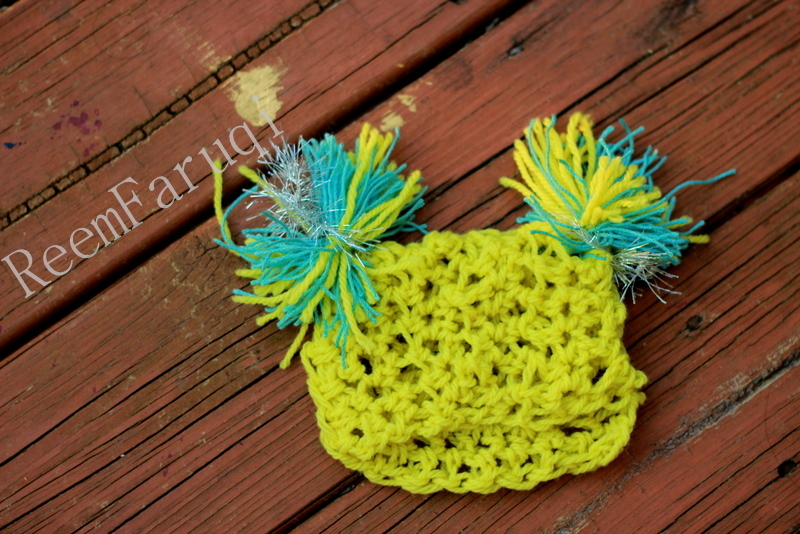 Chunky hats look adorable on itty bitty newborn heads! The Atlanta weather at the moment is too warm for a woolly hat, but luckily newborns need to keep their heads toasty, no matter when, so I’ve been crochetting like crazy. It’s so soothing and therapeutic. Your eyes relax, your fingers work, your needle dances within the wool, and you’re left with a beautiful little personalized baby gift for family and friends. I need to start my own hat business – full of chunky, funky hats with unique colours – colours that you can’t find in stores for babies, colours that look so refreshing on little ones! Why limit a baby to pastels? Let them live, breathe, and dream in colour! Presenting The Sibling Collection… for a toddler and newborn. 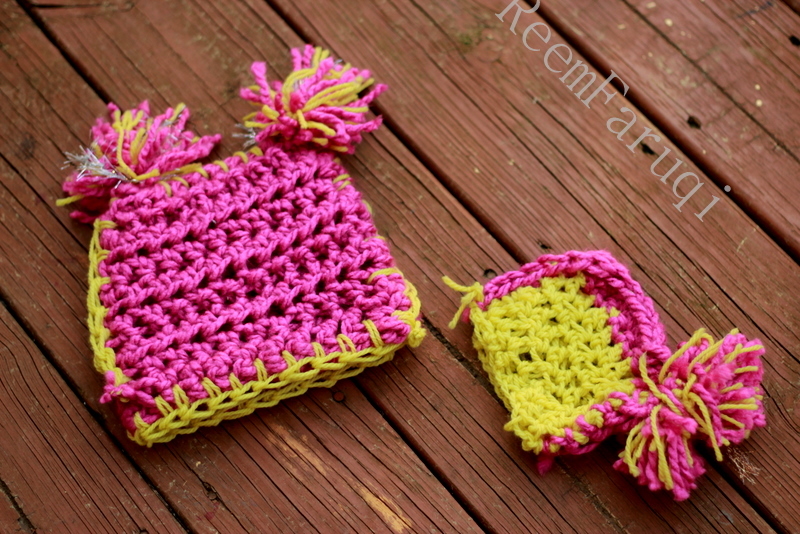 The one on the right is for a little newborn girl with an oversized asymmetrical pom pom. The one on the left is for my toddler cousin. Z modeled it for me today! 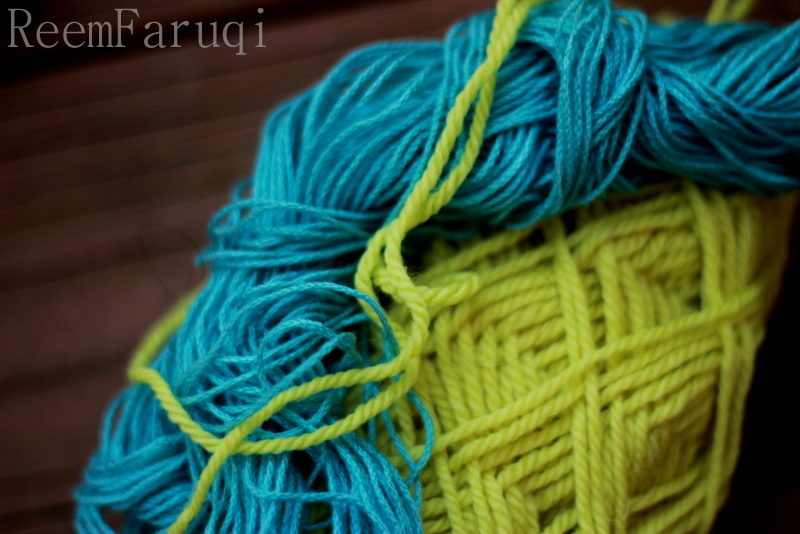 This chartreuse green looks fabulous with blue. The possibilities! An itty bitty hat for my newborn cousin. 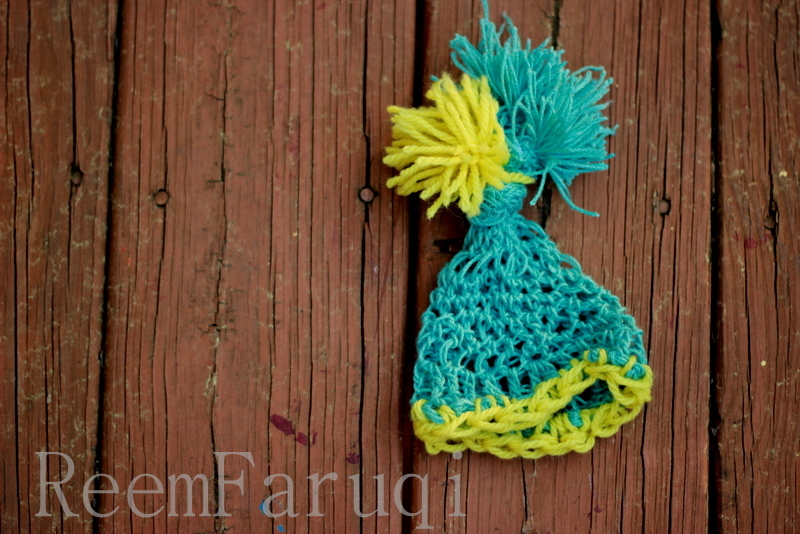 Another itty bitty hat for another newborn boy baby. I love how the green makes the blue stand out. And for a little family of 4! I like how the hats aren’t too matchy-matchy, and each is unique. The funky chunky wool is really making me happy, and I can make a hat when Z naps and also catch a nap. The author in the book I read knitted, but for me crocheting is easier. Another plus, Z can run around the house with my enormous crochet needle and I don’t have to rush to her and grab it from her. Funky Chunky Hats, here I come! “And God has made for you from your homes a place of rest and made for you from the hides of the animals tents which you find light on your day of travel and your day of encampment; and from their wool, fur and hair is furnishing and enjoyment for a time.” (Quran 16:80). This is inspirational! We are so blessed to see. I really am so grateful for my eyes! To see the beauty of the world around me! Love this post, Reem! And it seems you need to start a whole new website dedicated to your hat creations! Thanks Khalajee :). Would love to do hats more, will see how it goes and if I’m still hat making in a few days, then will do inshallah. We really are so grateful for eyes!